This year's update of our long-term study on the performance of equities and bonds in Switzerland can be downloaded here. The study compares the performance of Swiss equities with that of bonds denominated in Swiss francs since the end of 1925. Among other things, our empirical analysis conducted over many years shows that in the 93 years covered by the study a 100% equity portfolio was always able to achieve a positive total return over any investment period of 14 years or more. In the expert commentary, in addition to further conclusions on the right investment strategy for long-term investors, you will find a graphical presentation of the results using the Pictet yield triangle. 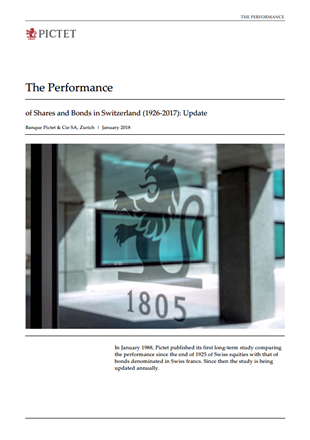 In January 1988, Pictet published its first long-term study comparing the performance since the end of 1925 of Swiss equities with that of bonds denominated in Swiss francs.